For many people, the first time they think about localisation is when their boss asks them to take responsibility for the program, often in the absence of any other volunteer. Usually, it’s a reaction to a market opportunity in-country — where a large sale is contingent on the availability of content in the local language. Whatever the reason, you have a short period of time to get the product into Japanese or German or Spanish. Before you translate a single word we’d advise that you take a step back and establish some parameters, if only for yourself, to avoid disasters that could have been avoided with a little forethought. Establish the stakeholders. Identify the people within your own company who will be affected by whatever actions you take as the program manager. Local sales and marketing contacts, corporate product management, product development and writing teams, as well as your friendly finance department will all have a part to play in either feeding you with material for localisation, helping your company to sell the product once it’s finished, or simply providing you with adequate resources to get the job done. One-to-one conversations need to take place to ascertain expectations and participation. You will need to call on the support of these stakeholders at various stages during the project and it’s always best to have acknowledged the importance of their role before you start. Set reasonable expectations. People within your organisation will probably want localised material produced more quickly and cheaply than is possible. Be sure to set reasonable expectations based on how prepared your product is for localisation, the volume of content to be localised and the various costs that will be involved in bringing this product to a localised market. 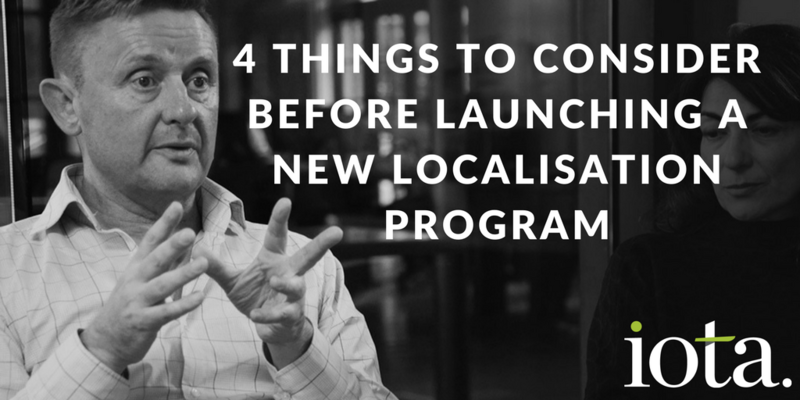 A good localisation partner will help with this at no cost to you, which leads to point 3. Choose an appropriate localisation partner. Find the partner that best fits your needs. That may sound like an obvious statement to make but it takes on so much more significance when you are on your first time round on this stuff. You’ll need company that is sized commensurate with your needs. Too small and you’ll overwhelm them, too big and you risk being viewed as a minor contributor to their vast revenues, and being treated as such. Even when you find the right company, you need to find the right person, one who’ll walk in your shoes for a while or, preferably, one who has done so already. Agree an outline of understanding with your stakeholders. Back to the stakeholders again….they’ll make or break this venture. Establish and individual quid pro quo understanding with each one so you can both measure and hold each other to account. Fix a reasonable budget with your financial colleague that fairly reflects the costs involved (including internal resource costs) . Establish a line of commitment from the development and writing leads, that gives you the support you need as problems surface during localisation (and they will surface!). Finally, agree a realistic schedule with your in-country staff — one that they can confidently commit to with their customers. Of course, there will be many other things to think about throughout the project — it’s a long road but one that’s best navigated with good planning and decent people to support you. We’re here if you need any advice. No obligation, no cost. When is a correct translation the wrong translation?